Forecast and technical analysis EURUSD on February 06, 2019. On Tuesday the 5th of February, trading on the euro closed down. The pair recommenced its decline as trading opened in Europe, with the drop gathering pace in the US session. By the end of the European session, the euro had dropped to 1.1401 against the dollar despite a disappointing services PMI report in the US. The pound dropped against the greenback to 1.2925 on the back of weak British PMI data from the services sector, as well as a broadly stronger dollar. 16:30 Canada: building permits (Dec). 16:30 US: nonfarm productivity (Q4), unit labour costs (Q4), trade balance (Nov). 18:00 Canada: Ivey PMI (Jan). 18:30 US: EIA crude oil stocks change (1 Feb). On Monday, the bears launched an assault on the 45th degree, and then on the 67th degree on Tuesday. In Asia, the euro slid to 1.1392. I’m expecting the rebound from 1.1380 (90th degree) to be small given that the cycles are showing a decline until the 8th of February, meaning that while there will be corrections, I don’t think it worth looking at long positions until Friday. Considering the speed of the euro’s decline, my forecast has the euro dropping to the lower line of the A-A channel or 1.1368. If the number of sales increases significantly, the pair may drop as far as 1.1356. 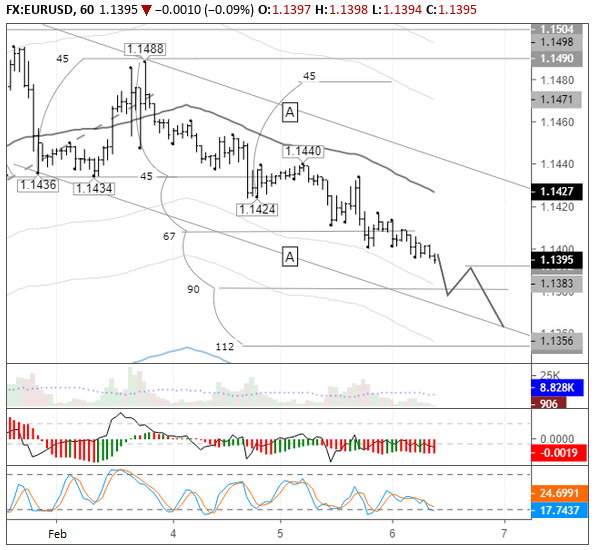 Prepare yourselves for the possibility of a sharp drop to 1.1325. In any case, I expect to see the pair drop to this level by Friday.